For those who have a child living with Type 1 Diabetes, there are many walks in life that others will never take. For our family, the first of these walks occurred when our youngest daughter, Maddie, was 7 years old. We walked her into Brenner’s Emergency Room, after having been told by our pediatrician that folks were waiting for her there, to take care of her. After 3 days of learning how to administer novolog and lantus shots, how to test blood sugars and count carbs, among a myriad of other frightening and sobering things to watch out for, we walked her out of Brenner’s Children’s Hospital and drove home to begin our new life. 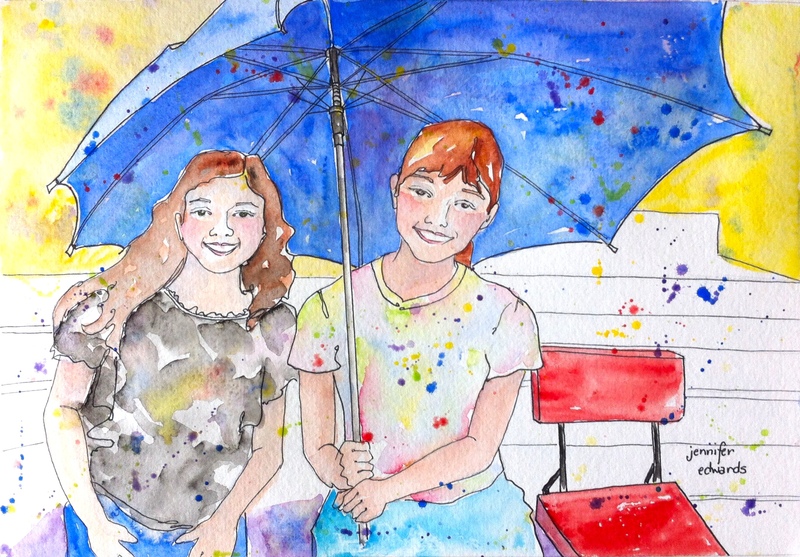 From there, we began the daily short walks to the spot in our kitchen where all diabetes supplies were housed…test kit, carb-counting book, insulin pens, alcohol swabs, tissues, and a chart for recording all the data. We have walked with her to and from the car when visiting her diabetes educator and doctor appointments every six weeks. We have walked in and out of her elementary, middle, and high school when emergency supplies were needed. We have walked in and out of pharmacies for the necessary medical supplies. We, as her parents, have walked her to soccer games, gymnastics, marching band…always wondering if she will need the extra juice boxes we have brought with us, or if some other diabetes related issue will arise. Our nightly walks are the ones that have perhaps logged the most miles…a midnight and 3 am blood sugar testing requires walking back and forth from our room to hers. Depending on the number, once we test her while she sleeps, it may require a walk downstairs to get more juice or other supplies to tend to the errant numbers. We begrudge none of these walks! Indeed, we would walk to the end of the earth and back for her if it meant helping in some way to alleviate the affects of Type 1 Diabetes on her body over the long haul. We are so very grateful for all the medical advances and technology that make her life less complicated than those who have dealt with Type 1 in past years. But there is a long way to go before a Cure is hers. 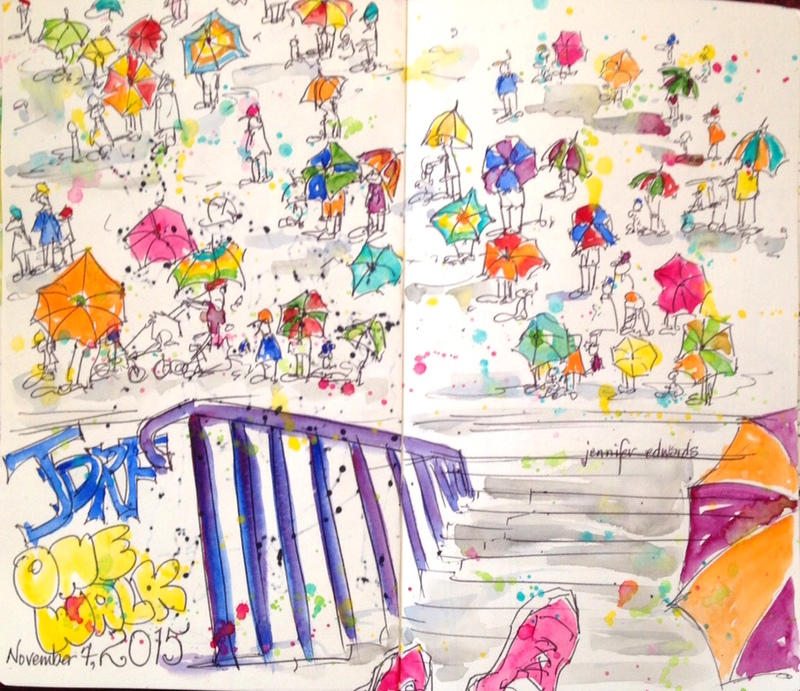 And to that end, we walk another kind of Walk…the JDRF One Walk each year. 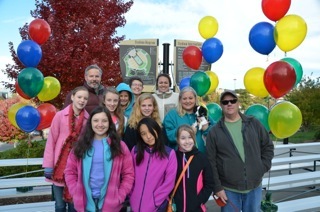 Maddie loves the JDRF Walks every fall! We are always amazed at the amount of support from friends, family and folks around the globe who have donated to JDRF in her honor. And then to walk with friends and family on that day along with so many others, truly makes us feel like we are not alone! When Maddie entered high school last year, it was not possible to walk in any other of the fall JDRF Walks, and we tried again this past fall, but marching band and a high school youth retreat, have prevented our participation each year. She decided a few weeks ago that she wanted to walk in the spring, taking part in the JDRF One Walk in High Point instead of in Winston-Salem, NC. Randy and I were glad for her to have another opportunity to walk with friends and family, raising funds for a Cure for T1D. But a few days ago, she discovered that her involvement in Show Choir was going to prevent her from Walking on April 28th. She was very disappointed, as this event was rescheduled due to a snow day earlier. She needs to be there, as she is part of a team who has been practicing since the beginning of the school year. Randy and I will walk in her honor and would be honored for your presence with us, and for your financial donation to JDRF on Maddie’s behalf. The wonderful bit of all this is that the reason Maddie can be so involved in school activities, is because of all the advancements that JDRF has funded over the years for those living with Type One Diabetes. Without her insulin pump, Continuous Glucose Monitor, blood sugar testing kits, etc, participating in marching band and show choir would be extremely difficult. We will gladly send her on to Raleigh for the Show Choir Competition, while walking with JDRF this Saturday in High Point, NC. Won’t you consider donating to this terrific organization as they continue to do research, looking for a Cure as well as other advancements to make living with Type One a bit more manageable. If you’d like to donate, click the link to directly donate to JDRF in Maddie’s honor. Thank you so much in advance for all your support, both financially and in friendship. Maddie thanks you! Randy and I thank you! Your donations and presence with us, make walking this path of Type One Diabetes so much more endurable, enjoyable, and may one day lead us to the Cure we need for Maddie and so many others living with this disease. P.S. The first drawing in this post was made just a couple of days ago, as our silly yet oh-so-studious straight A student sat “studying” her book. 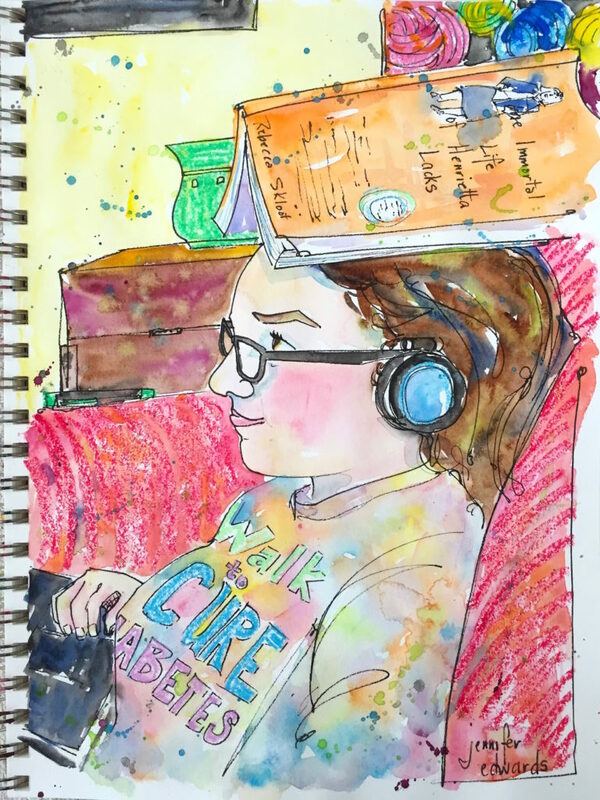 I thought this was such a cute way of trying to absorb the information by osmosis, that I had to snap a photo and make a drawing of our 16 year old, sweet as ever, girl. <3 The other drawings have been made over the years of Walking with our daughter. Stepping down into the throng of people lining up to Walk is always a bit emotional for me. To see a sea of fellow humans who are, in some fashion, walking this path of Type 1 Diabetes, is at once startling and comforting. Startling in the fact that this wretched disease touches so many lives, children as well as adults. Comforting to know that we are not alone in the daily fight to manage blood sugars. Though it drizzled rain for much of the morning, I felt a torrent of love and support for our daughter Maddie. She feels it too I’m sure. Friends and family from far and near came to walk with her. To say with their presence–We are here Maddie, to walk with you in the fight to find a cure for Type 1 Diabetes and to support you and your family’s efforts to manage the disease. Our clever girl designed new t-shirts this year with a Harry Potter theme. 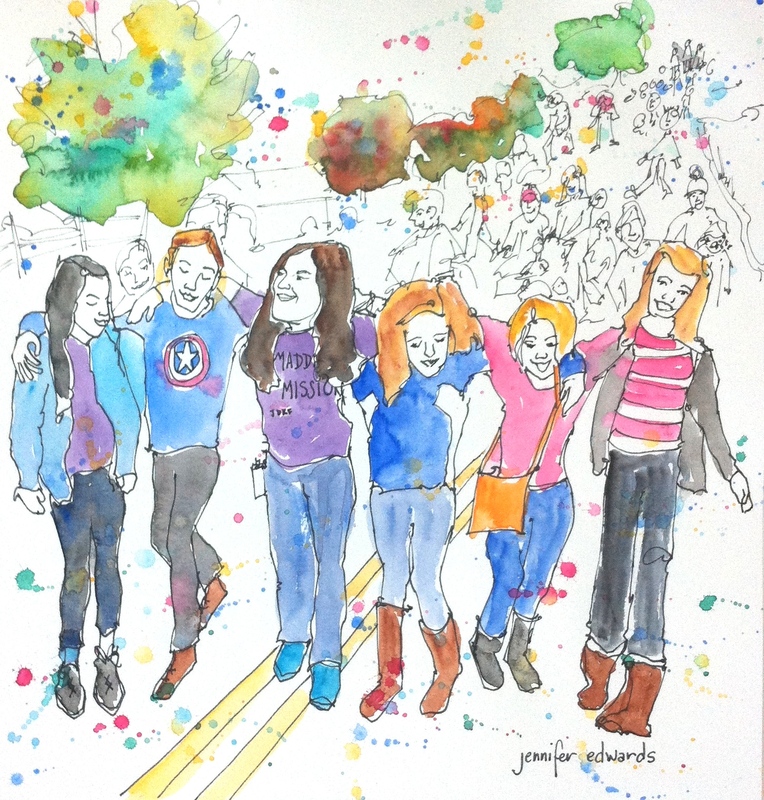 In this sketch, she and her cousins and friends showed that they are indeed UP for a cure! 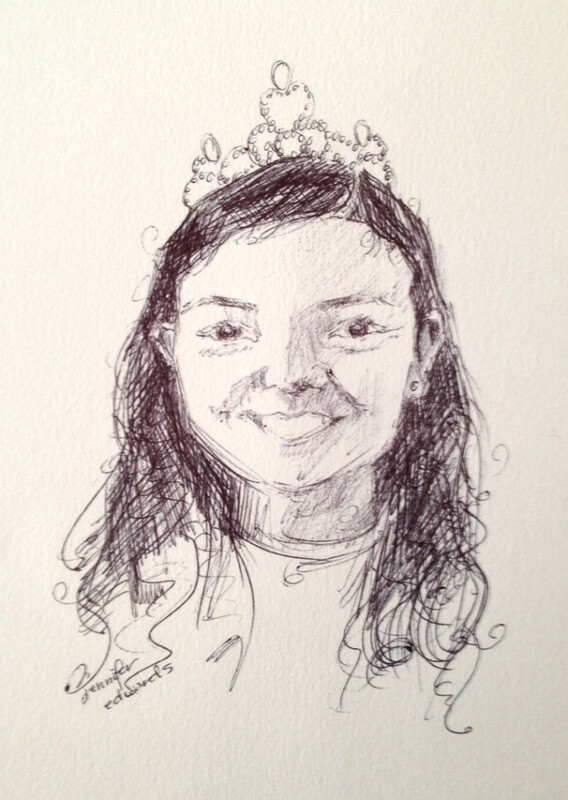 Thanks Aunt Tracy for a great photo to draw from! 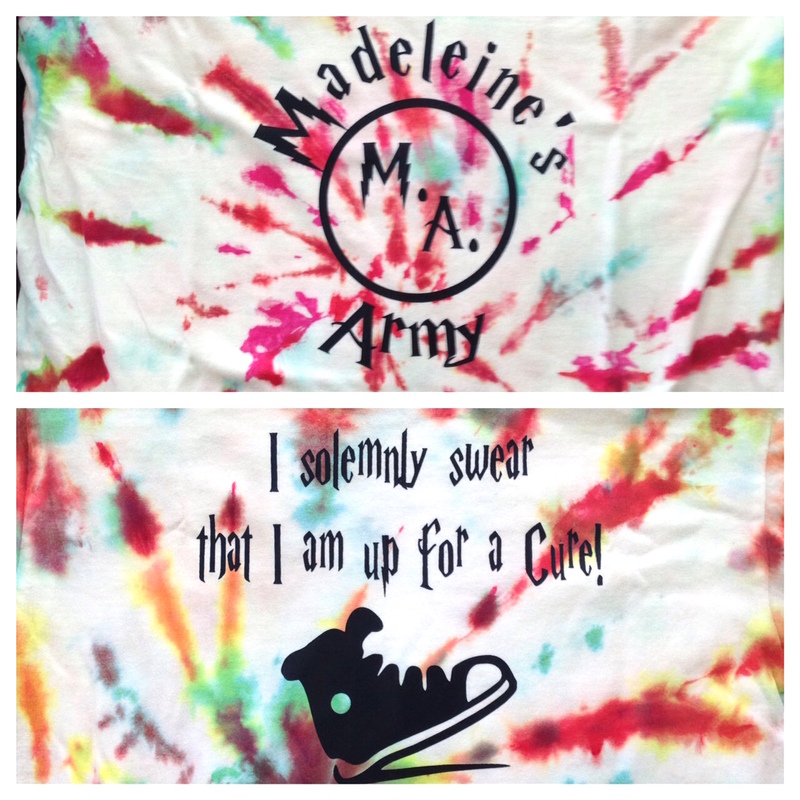 Thank you RedHeaded T-shirts for printing Maddie’s design. And thank you , each and every one of you who donated money to Madeleine’s Army (formerly known as Maddie’s Mission). One day we will see a cure for this disease. We hope! But in the meantime, it is wonderful to know that Maddie has an army of people who love and support her in the daily challenge of living with Type 1 Diabetes. With all my heart…Thank you. P.S. Because of your amazing donations, our daughter was able to walk the red carpet as a V1P!! This was a special treat for those teams who had raised over $1,000. Also, her t-shirt design was awarded a gold medal for Most Artistic Design. Congrats Maddie! Many of you know the hero who lives in our home. You’ve read about her diagnosis six years ago, the ups and downs of living with Type 1 Diabetes, her bravery and courage in the face of the daily challenges of managing the disease, and the Walk we look forward to each year rallying friends and family to support our hero and all the heroes of juvenile diabetes. Since the age of 7, Maddie has become intimately acquainted with the discoveries and helps JDRF has brought about to make living with T1D possible. Blood sugar testing devices, insulin, shots and a pump. These are all the weapons with which our hero fights back the debilitating effects of out-of-control blood sugars. Her ongoing commitment to use these fools not only enables her to LIVE, but to live well and healthy. We are grateful beyond words for her and for JDRF. In this last year, Maddie has added to her arsenal of Type 1 weaponry. she now wears on her body not one, but two insets–one for her insulin pump and now another for a CGM. The Continuous Glucose Monitor, shows us the trends in her blood sugar levels as it continually gauges them via the interstitial tissue. The monitor also sounds an alarm when her blood sugars hit levels either too high or too low, thus alerting her to test her blood sugar and make the necessary adjustment to bring her blood sugars back to a healthier level. It was Maddie who wanted this new device. Over the last couple of years, she had noticed (as well as Randy and I, her parents) that she was not able to feel when her blood sugars were low until they got down to a scary level. She used to be able to feel it when her blood sugars were in the 70’s and 60’s. Now she sometimes hasn’t a clue until her blood sugars are in the 40’s! We were impressed and amazed that a 13-year-old would want yet another device to wear, keep up with, and manage. One who continues fighting the good fight, day in and day out, in the face of challenges of all kinds–discouragement, frustration, discomfort, and even others’ misunderstandings. On November 7th we Walk in support of our hero and on behalf of all the other brave and courageous families and children affected by Type 1 Diabetes. We invite you to join us! 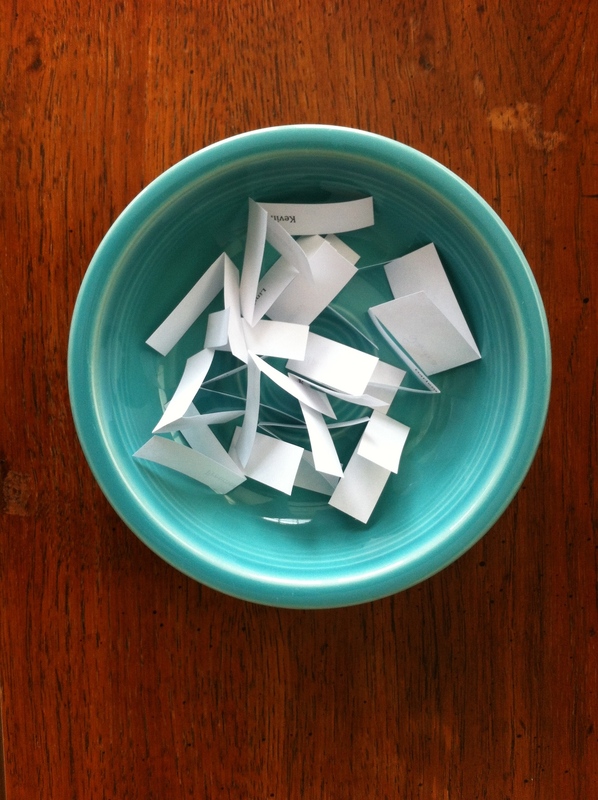 Your contribution to JDRF will continue the ongoing research to create better tools for managing T1D and for finding a Cure! So many wonderful things are on the horizon! We appreciate any support you can offer!! and/or sign up to walk with us on November 7th. Life should be lived walking through it together. Burdens are best carried arm in arm with friends. Joy breaks forth when many feet move in a common direction. Love is felt when others choose to walk alongside us. All of this, and so much more, I experience when we Walk for a Cure one Saturday a year in Winston-Salem, NC when a ribbon of people gather to walk with Type 1 Diabetic children and adults, all raising money for JDRF, all supporting the life these individuals live on a daily basis. Maddie’s smile beams all morning long as she is surrounded by friends who have chosen to walk with her. 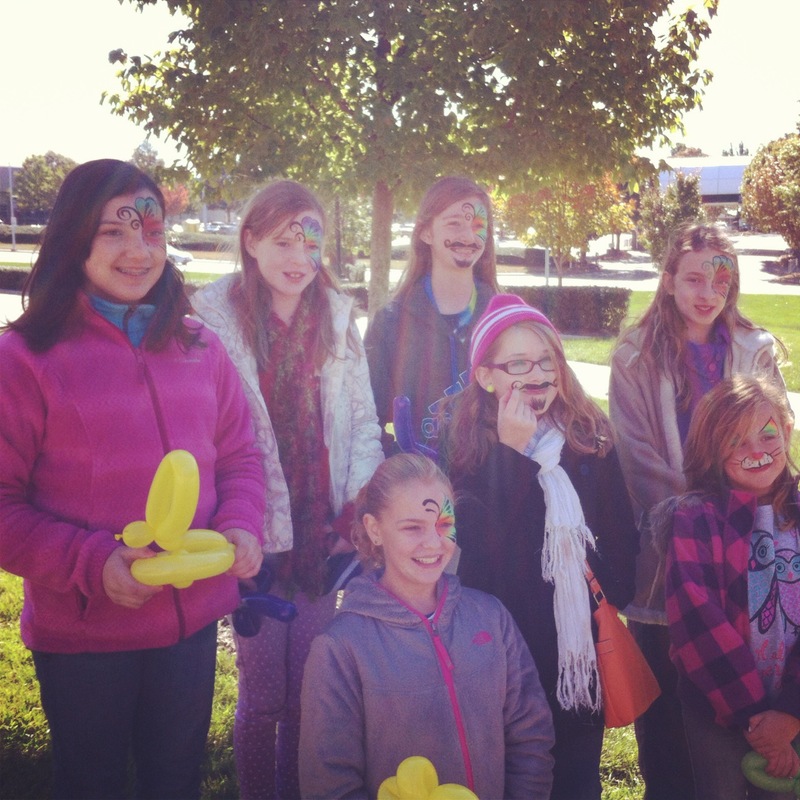 Conversation and laughter about everything BUT T1D peals through the crisp fall air. Pictures are taken to remember the day, especially the favorite part of getting faces painted by an incredibly talented clown named Sonshyne. Randy and I relish the camaraderie of adult friends who have also set aside their usual Saturday morning routine to come and walk with us. We remember with amazement all the folks who so generously gave their money in honor of Maddie’s Mission, doubling our goal! Yes, doubling it!! For all of this, we are so very grateful! At the end of a road down which I walk each day, is a wonderful old barn. This barn sits on Smith land and is a part of Smith Hollow Farm where my artist friend Debbie and I have spent many a happy morning drawing the land, their horses, goats, and donkey named Elvis. As I sat here drawing this view, Mr. Smith drove up in his truck and hollered at me that I could go on down into the land further to paint or draw whenever I liked. I always breathe a sigh of relief when I receive a happy greeting. One never knows. Barns are a favorite of mine, to draw and paint for sure, and to just gaze at and wonder about the history and life lived in and around the barn. Years ago, at Appalachian State University, I was able to see a show of pastel paintings by Wolf Kahn and I distinctly remember saying to my mom: I wish I had been the one to make these paintings. It would be so cool to travel from one end of North Carolina to the other, drawing and painting the barns. Just in my hometown of Boone, the number of barns would keep me busy for years I’m sure. I would want not just to draw them, but also interview their owners, find out a bit of the history of the barn, the family who built and owned it, etc. If anyone wants to hire me to drawcument Watauga County’s barns… Ha! Wouldn’t that be fun? 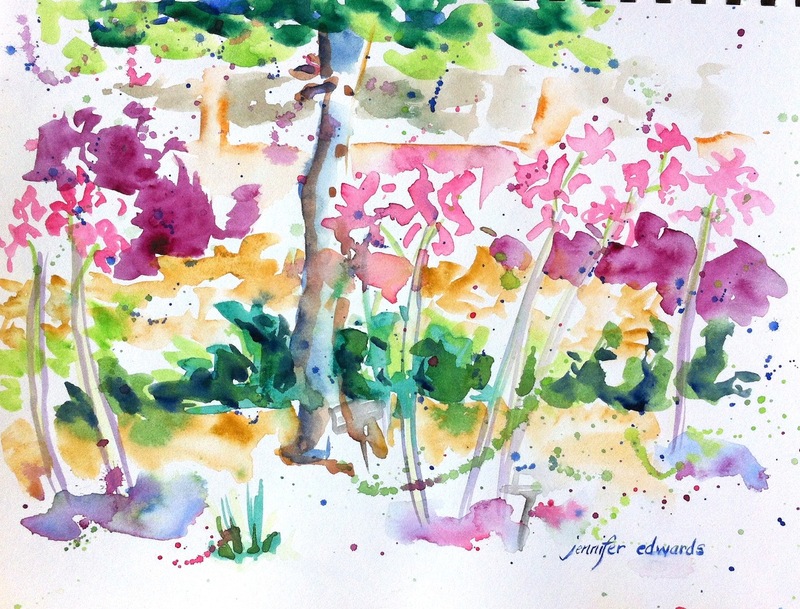 The temps are much cooler this week and I have a feeling Debbie and I will be drawing indoors, returning to Eclection as our cold-weather haunt. I will surely miss drawing outdoors. 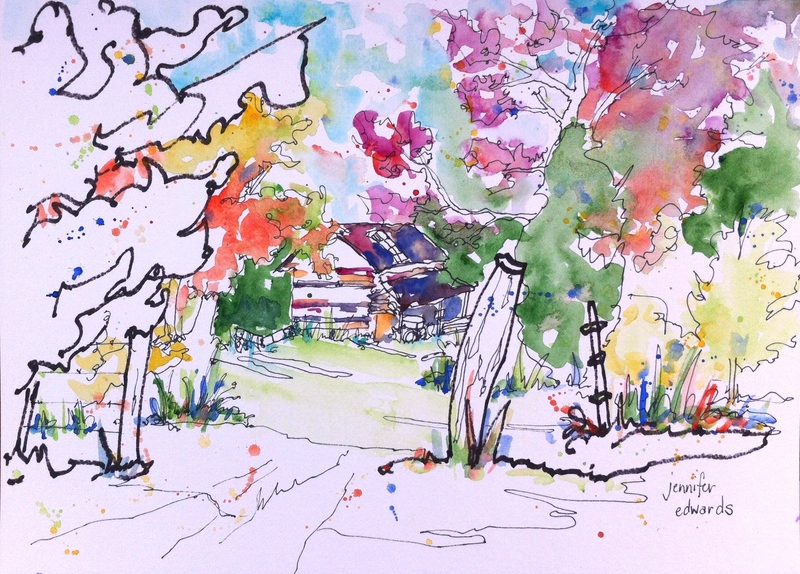 I’ve been stealing away to draw in my yard lately, on the back deck, and enjoy the beautiful colors we are having. The winds are starting to blow them away. November is a busy full month for me! 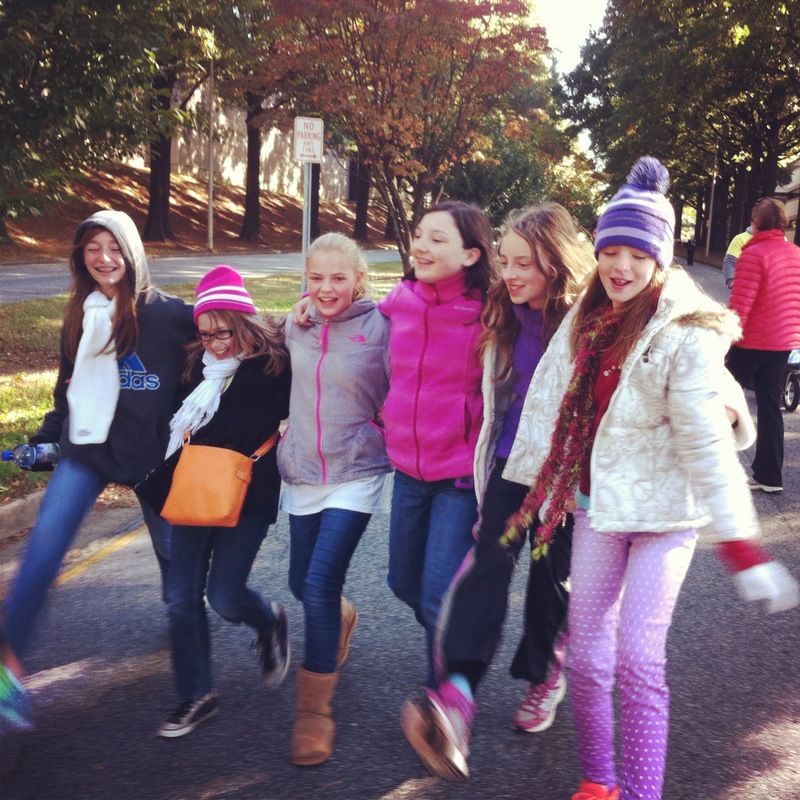 The JDRF Walk for the Cure is this weekend and there’s still time to donate! Then I have an Art Show on the 22nd at Southwinds Gallery (do come for any portion of the 4-7 pm time slot on that Saturday!). Then Thanksgiving, followed by my parents 50th Wedding Anniversary party on the 29th. Full indeed! We say this for many reasons, but mostly because of the amazing way she handles living with Type 1 Diabetes. We said it to her when she learned this year to give herself her own inset WITHOUT any lidocaine! We say it to her when she has to repeatedly prick her finger to get enough blood to test her sugars. We say it to her when she recounts how a substitute teacher treated her poorly when her pump alarm went off in class. We said it to her when she stood in a choral group to sing and a teacher ( who did not know her) went off on her about getting rid of her “cell phone”. No alarm had gone off. The teacher just didn’t like the “look” of her pump being visible. We say it to her when she comes home from school telling us how a student asked her for the umpteenth time–“What’s that?” After she has explained it to her numerous times. We say it to her when she chooses to do all the things necessary for keeping her blood sugars under some sort of control…testing and eating something when she feels “low”, giving a correction and drinking water when her sugars are high, exercising, etc. We say it to her when she patiently endures people saying stupid things to her like, “You don’t LOOK like you have diabetes.” Ugh. We say it to her when she goes to a birthday party or a sleepover and makes wise choices about what she eats and boluses the insulin needed for her to enjoy the party. 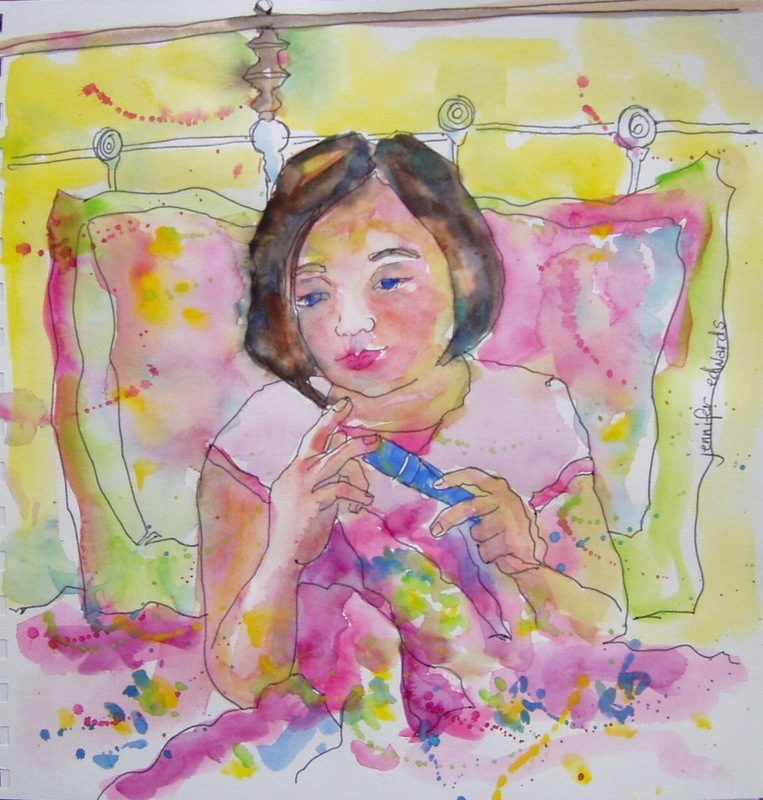 Time and time again, she models to us a fortitude in spirit and a graciousness of character to endure on a daily basis, living with Type 1 Diabetes. Randy and I want so much for her to be free of this disease. We want all children and adults who live with Type 1 to have a cure available to them. On November 8th we will walk with her, proud to be her parents. Her older sister (pictured above) and brother are also heroes for the countless times they have stepped in to care for Maddie and to learn all they need to be able to help her live with this disease. We Walk for the amazing heroes of Type 1 Diabetic children and their families who bravely face each day together! Please join us on our Walk! 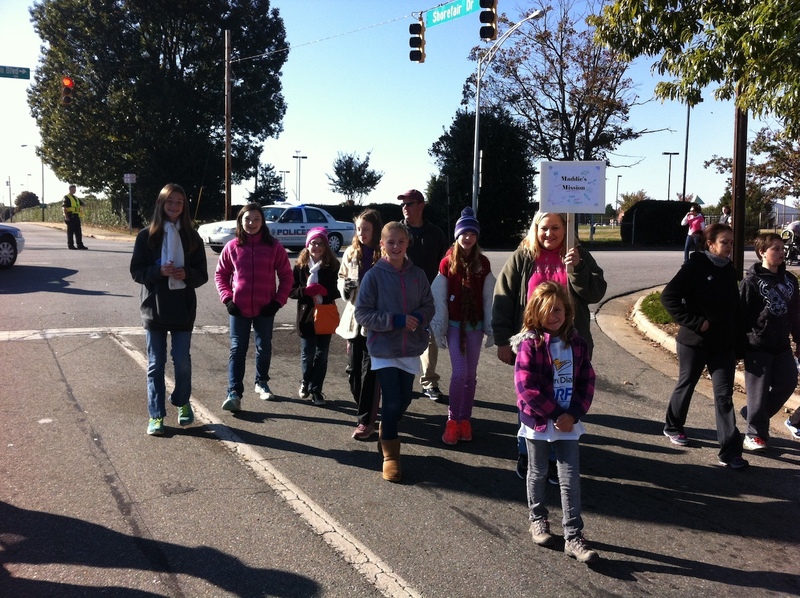 We would love for you to walk with us in Winston-Salem! Or you can give to help find a cure for our daughter and so many others! Every year, for the past four years, we have been amazed at your generosity!! Should you wish to donate to Maddie’s Mission to find a cure, click here. ***To read more posts about our life with Type 1 Diabetes, check the Category here. We awoke to 25 degree (Fahrenheit) weather…brrrrr! Maddie and I pulled on layers of clothing to stay warm outside for a morning Walk. We picked up several of her friends on our way to the BB&T Field in Winston-Salem, NC and joined a throng of other winter-garbed folks for a brisk Walk for a worthy cause! We walked near the end of the line this year. 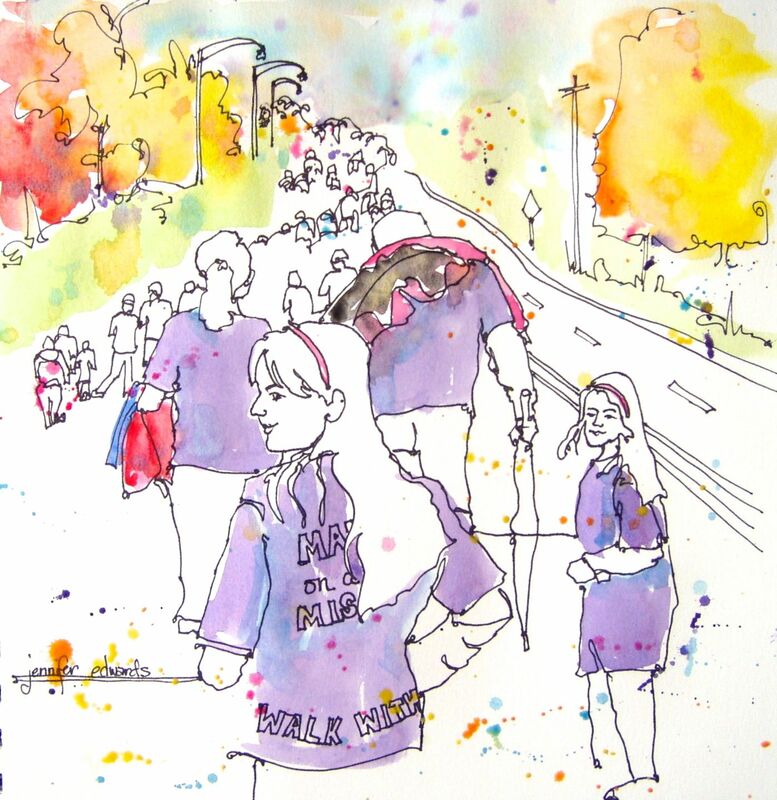 It’s quite moving to see the ribbon of people wind in front of you, to hear Maddie’s laughter with her friends, to talk with the family who had joined us that day to Walk. 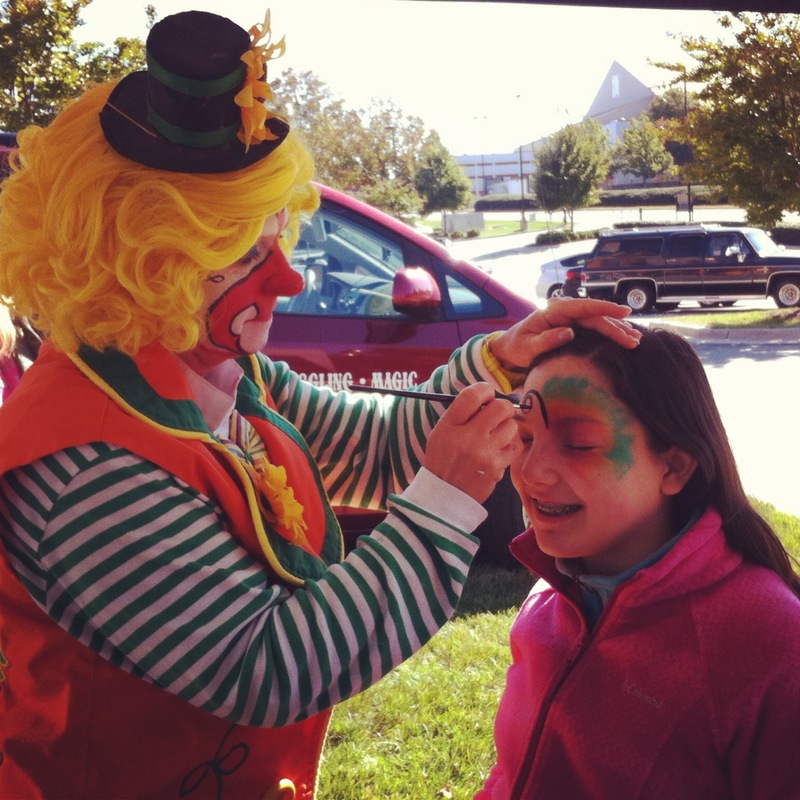 We ate all kinds of yummy foods provided by local sponsors, played in inflatable climbing/sliding structures, and got our faces painted by Sonshyne of the amazing clown duo, Sonshyne and Jots of Circus Daze. All in all, the generosity of folks giving to Maddie’s Mission to find a Cure for Type 1 Diabetes, totaled over $800! We cannot thank you enough. But this figure was added to all the others raising money for the cause, which reached a staggering $378,607.26 and is still climbing as other donations come in. Thank you, thank you for your gracious giving to help find a cure for this disease!! 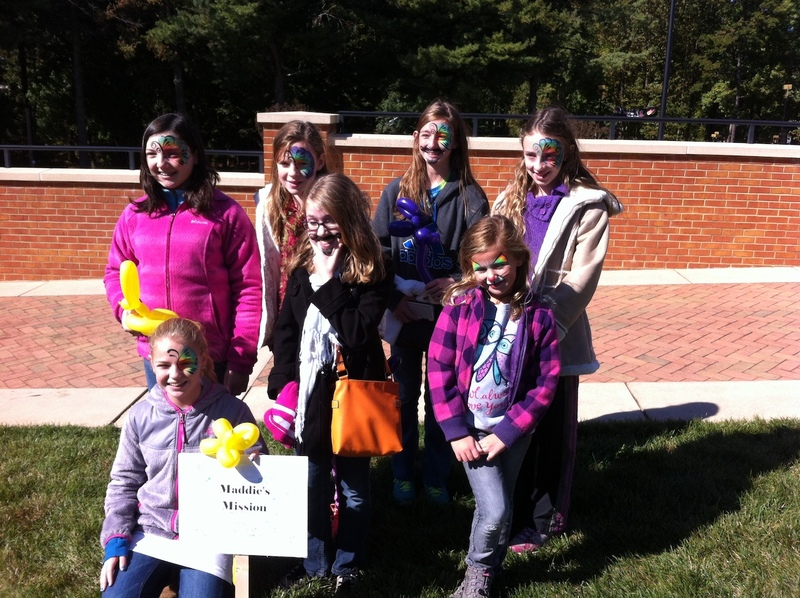 As I walked, I thought of each and every one of who had donated money to Maddie’s Mission. Thank you to ALL who gave and walked with us! It could not have been a more perfect day! P.S. The above drawing was made from the photograph you see here. 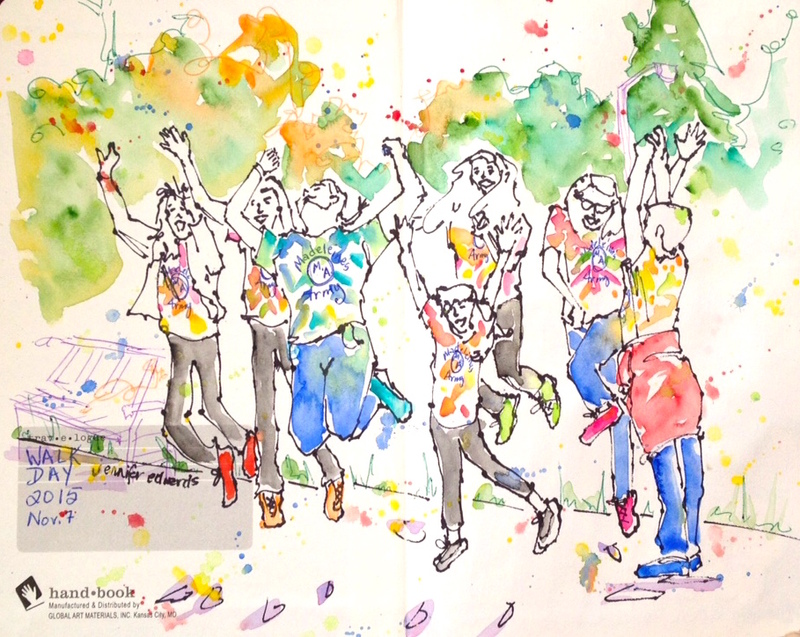 You all know how much love line drawings….for many reasons, but a major one is how it so beautifully depicts the connection between these sweet friends of Maddie’s. 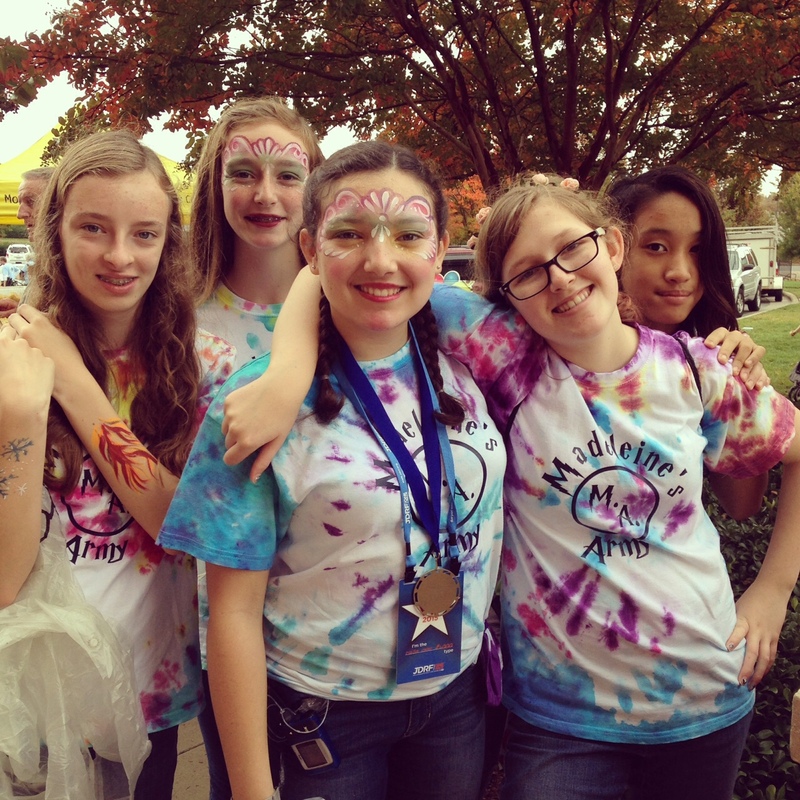 Though her friends do not have Type 1 Diabetes, they support and care for her in so many lovely ways. 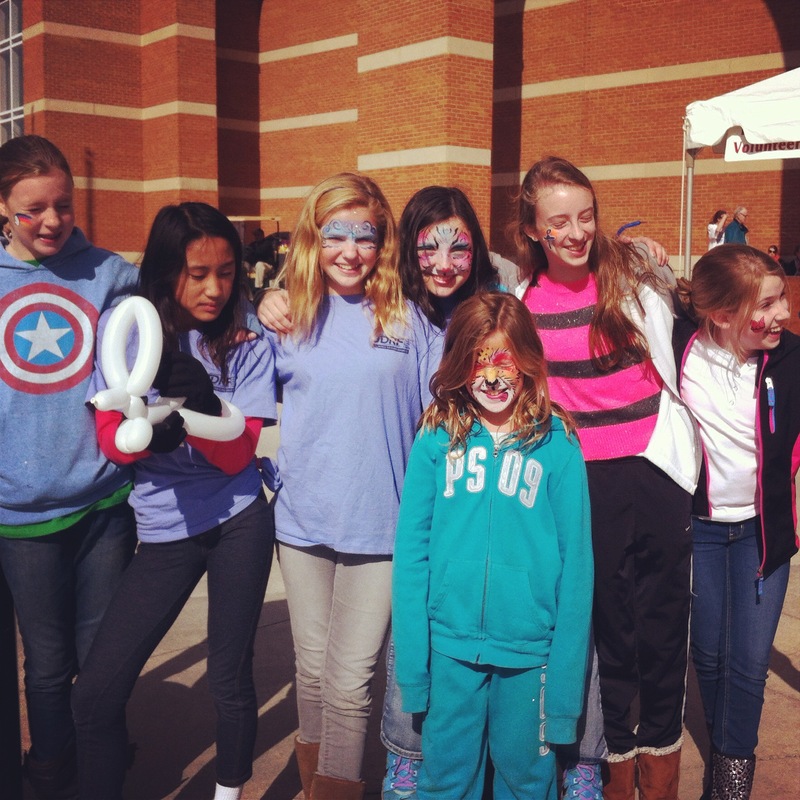 This day was just one of the ways that her friends stand and walk with Maddie, supporting her along her path. Thank you Aida, Sigourney, Kaitlyn, Zoe, and Kaley!! Thank you also to the whole Mueller family for walking with us!! Your presence there made the day all the more special to us! I’m so excited to announce a new set of cards available in my Etsy Shoppe! 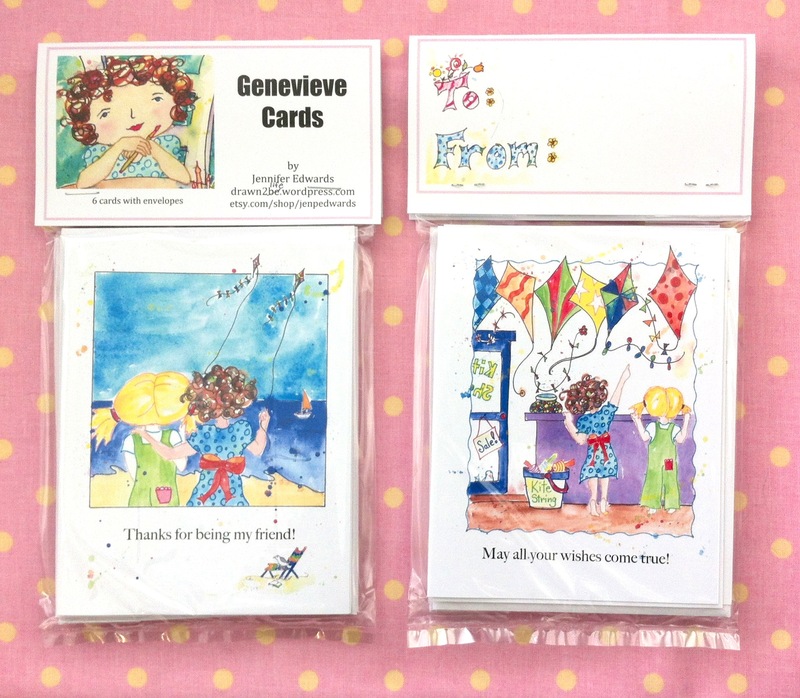 Created from two of the images in my new children’s book, Genevieve and the Kite, this set of cards is useful for any number of card-giving occasions! These are two of my favorite images from the book! 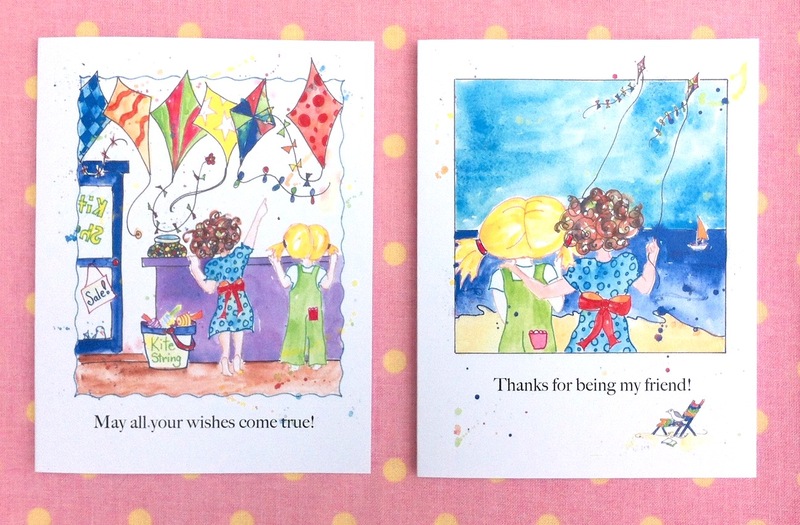 “May all your wishes come true!” could be given for a Birthday or Graduation or any special occasion. While “Thanks for being my friend!” could be for just that! Or as a thank you! **Only a few more days until the JDRF Walk for the Cure! We have a few of Maddie’s friends walking with us on Saturday. If you would like to join us for the Walk, please let me know!! We will be there around 9:15 am and the walk begins at 10 am sharp! It’s so much fun! 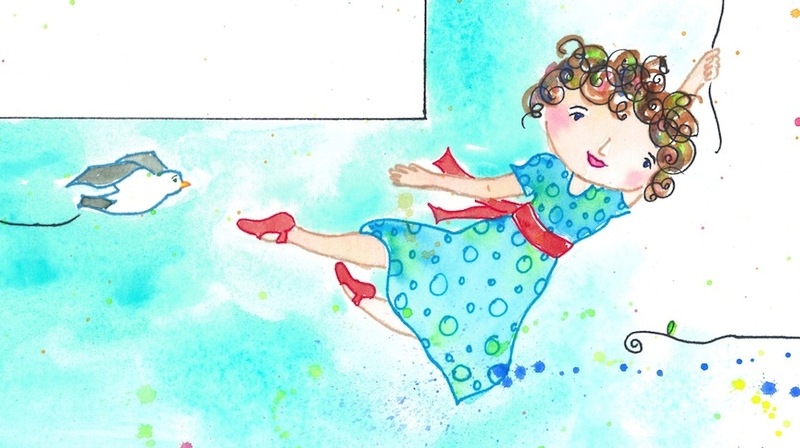 And if you’d still like to make a donation in ANY AMOUNT, I will include your name in a drawing for a FREE copy of Genevieve and the Kite! I’m feeling quite overwhelmed these days. The only way I can wrap my head around it is that we’re experiencing a harvest time in our family. With the goodness of a harvest, comes a lot of activity. It’s all good. But wow. It’s a lot. Another thing growing in our Garden is an EP of six original songs and retuned hymns, titled Songs of Grace, by three incredible musicians in our church. One of these guys is the fella who lets kids throw pies at him. 🙂 He’s pretty special to me. Every time I listen to this CD, I’m amazed at his voice and all the talent these men have. If you enjoy worship music, click here to go the BandCamp site where you can stream and listen (free!) 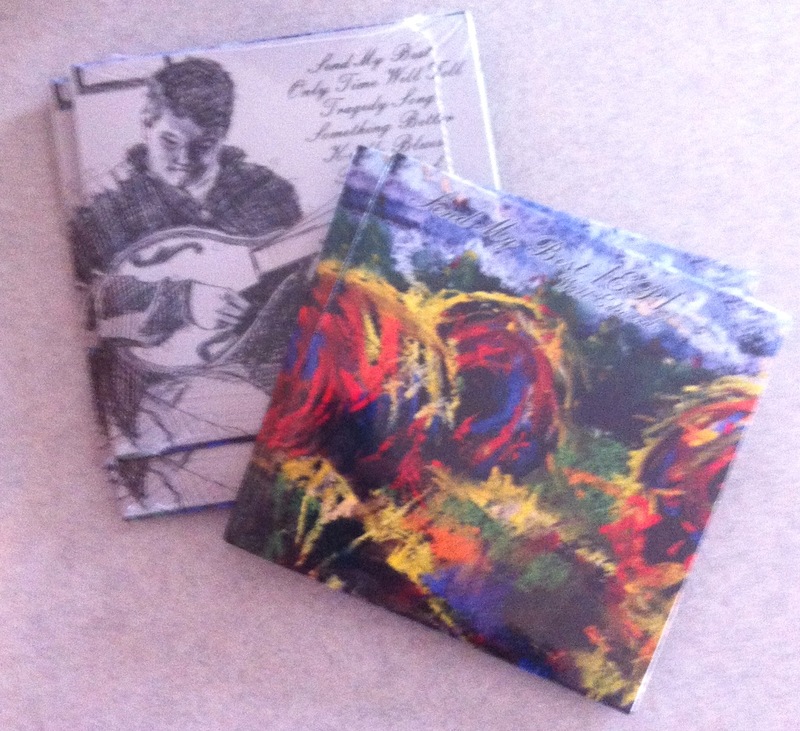 to the songs, and/or purchase the digital downloads for so cheap! Also available there for free are the lead sheets to the music so that you or your church can incorporate these tunes into your worship experience. It truly is beautiful music. And…our son. Goodness me. 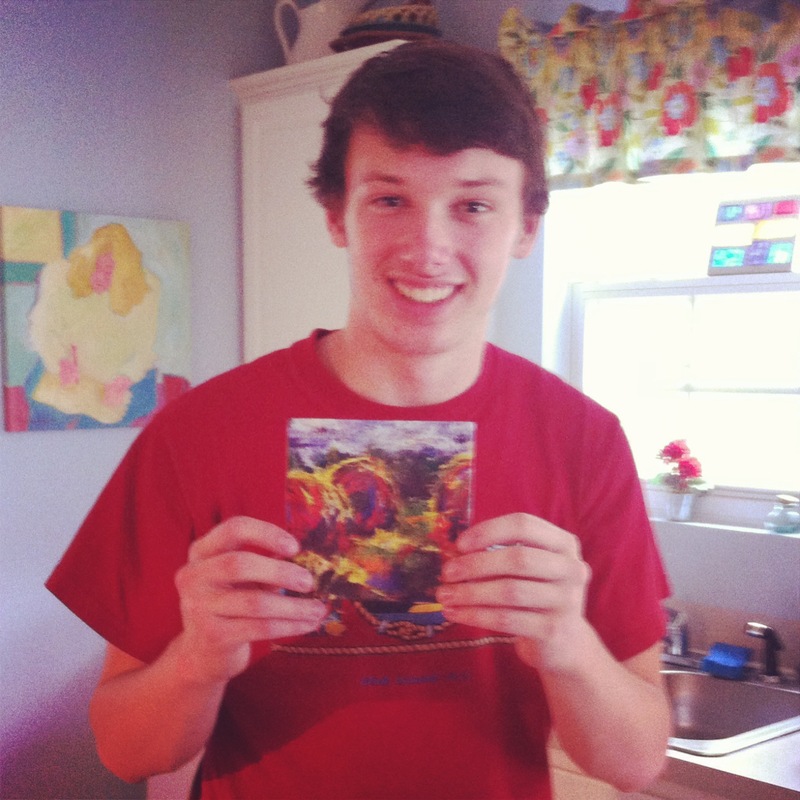 As if the above two weren’t enough, our son William’s EP of original songs came out last week as well! We have watched (and listened) to him bloom into an amazing musician/singer songwriter. 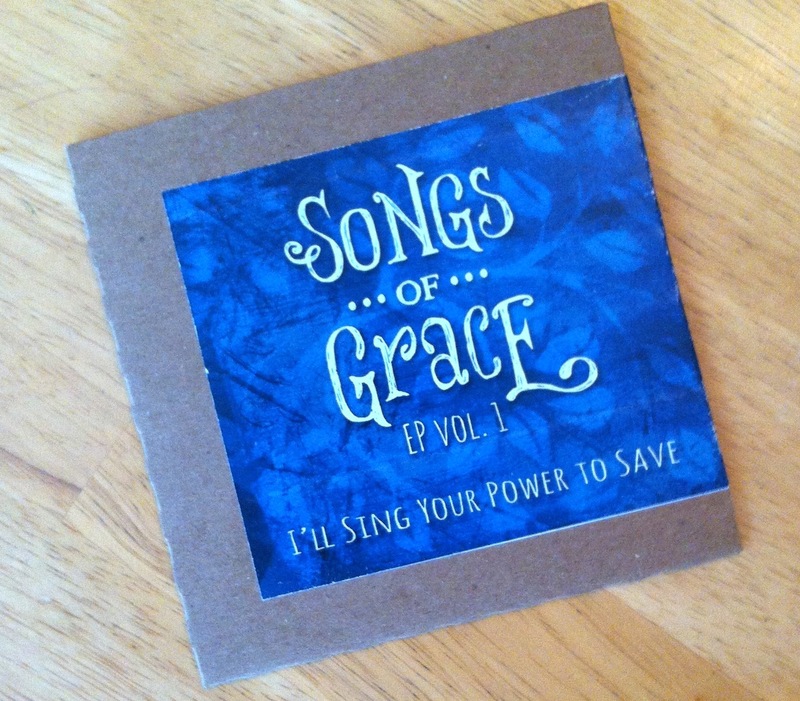 With the help and expertise of Michael Kuehn, a friend in our church and one of the guys featured on the Songs of Grace CD mentioned above, William was able to record six of his own songs and compile them onto a CD. 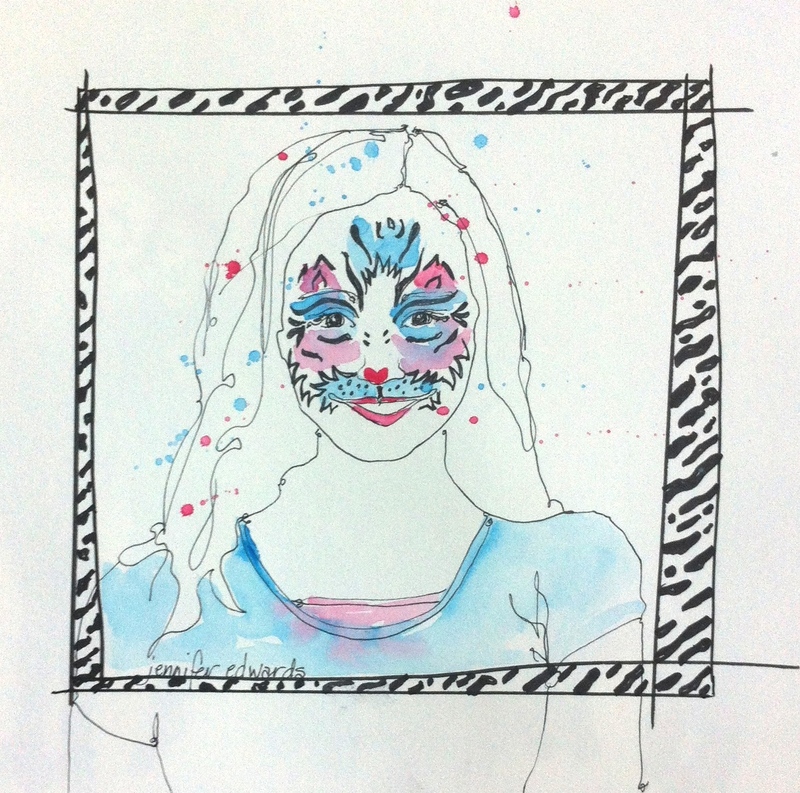 When he asked me for artwork for the cover, I was happy to oblige. 🙂 (If I type any more of these smiley faces, it’s gonna be obnoxious!) William plays guitar, banjo, and harmonica and sings, while Michael has added numerous other instruments to make for a marvelous listen. Randy and I are so proud of and excited for our 16 year old boy. Whew. Harvest time for a farming family is the busiest time of year. And the above three things are only just a few of the things going on in our family. Our oldest just performed in her Fall Concert at Wingate University and will be performing in the their fall opera in just a few weeks. And the JDRF Walk is coming up for Maddie and I. Once again, we have been overwhelmed by your generosity in giving on her behalf for this wonderful organization. We can’t wait to walk on Saturday October 26th to represent Maddie and all of you who have supported her in finding a cure for Type 1 Diabetes!! I feel a bit like I’ve got the Kite by the tail and I’m soaring off into some pretty lovely, but unknown realms. Thank you to all of you, dear readers, for your cheers, your encouragements in comments, your thoughts and prayers. We, the Edwards family, are so blessed by you! I received a text from my youngest daughter Maddie when she was at school on Thursday morning. 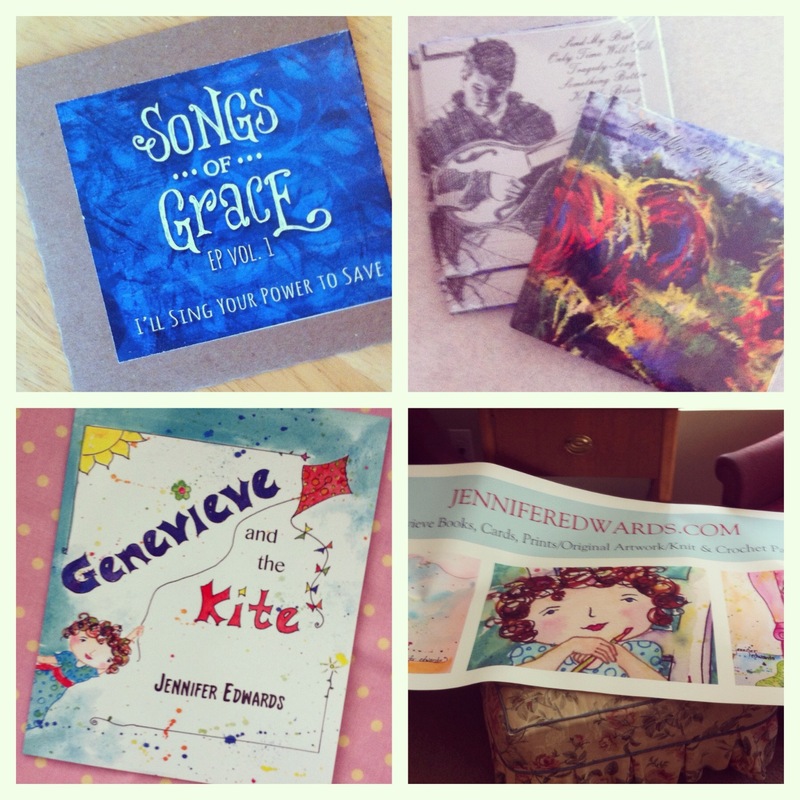 Sitting at the computer, I was marveling at all the “likes” and “congrats” and purchases for my children’s book, Genevieve and the Kite. It felt like my kite was flying high in the breeze and I was along for the ride, enjoying every bit of it. Immediately, my feet hit the ground, let go of the kite, and off I went to the middle school. This news isn’t the worst thing you could hear from your T1D child. But it IS a show stopper, one for which you leave whatever it is you’re doing at the moment to go take care of. Without insulin, she will go into ketoacidosis from no basal rates nor the ability to process the carbs she eats. As I was leaving the school, Maddie with a full cartridge in her pump and having corrected for the high blood sugar, I knew the goodness of that dose of reality. Diabetes is no respecter of persons. It does not care what you have going on in your life. It roller coasters without warning. It does what it’s going to do. It is what it is…a life-threatening disease. The amazing technology developed over the years, has allowed Type 1 Diabetics to live what so many call “a normal life”. I still, after 3 1/2 years, rankle at that phrase. Yet this is the life my daughter lives, day in and day out. My husband and I live it with her. It is our reality. And viewed from a perspective of trust, it is a reality that anchors me, provides a tether to my flights of fancy. I have many callings on my life. Yes, being an artist is one. But I’m also called to care for our children and to be willing to ride the roller coaster of Type 1 Diabetes. We Walk in less than two weeks! 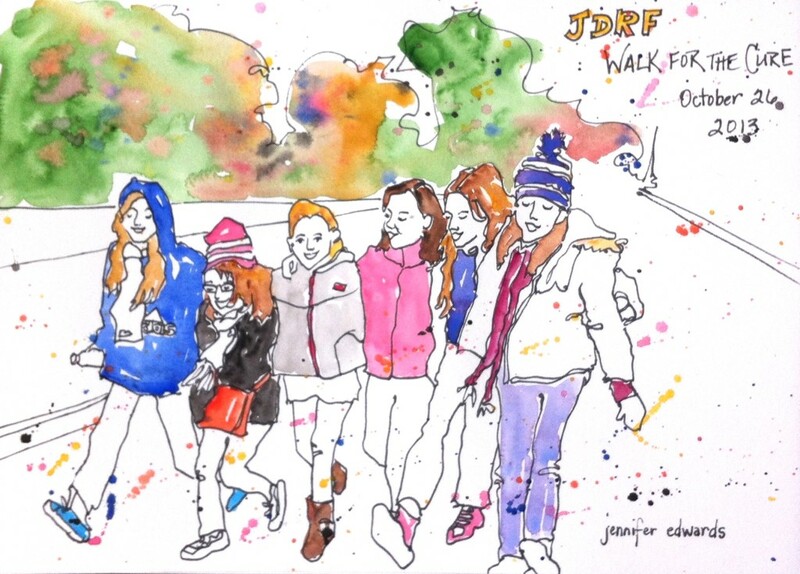 You can read here and here, other posts about our walks to raise awareness and funds to find a cure for Type 1 Diabetes. A cure is on the horizon!! We are excited to hear about the developments and successes going on in the world of science. Someday soon, my daughter might live a life that is a good bit closer to what we would call “normal”. And that will be a blessing!! 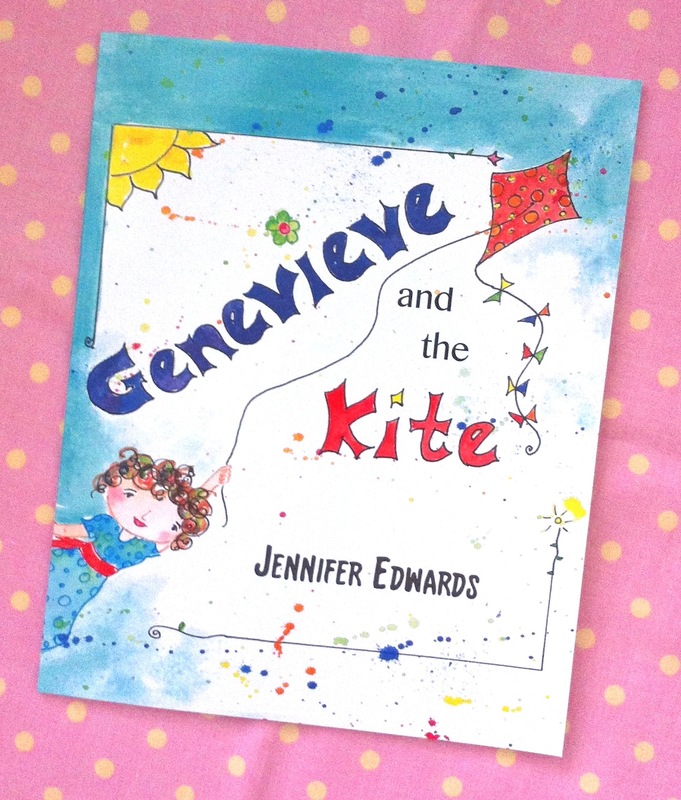 **I am offering a giveaway of my book Genevieve and the Kite! For ANY DONATION, $2, $5, $10, whatever, to JDRF in honor of Maddie and her Mission to cure Diabetes, I will enter your name in a drawing. 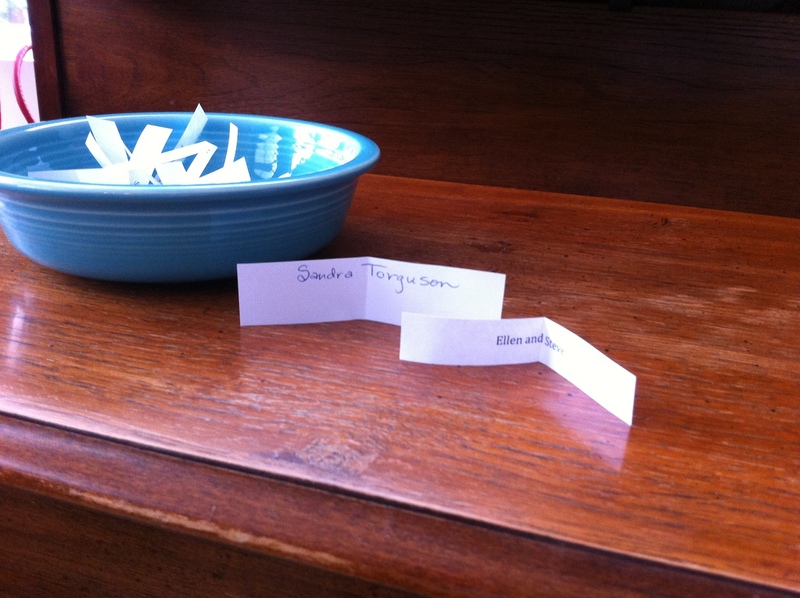 The day of the Walk, I’ll have Maddie pull a name to see who wins! If you’ve already purchased a copy, perhaps you’d like another to give to a friend? We are always amazed at everyone’s generosity to give to this awesome cause in Maddie’s honor. Click Here to make your donation to JDRF for Maddie’s Mission! Randy and I thank you!